Monitor 4K 4K101HSD-256 là một sản phẩm mới của hãng sản xuất Feelworld với kích thước màn hình là 10.1 inch. Độ phân giải 2560×1600 pixels với tỷ lệ khung hình 16:10. 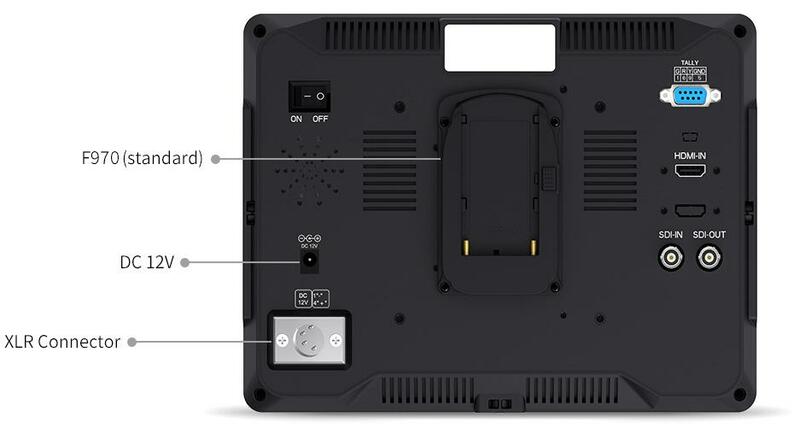 Monitor 4K 10.1″ Feelworld đem lại những hình ảnh sắc nét chất lượng cao. 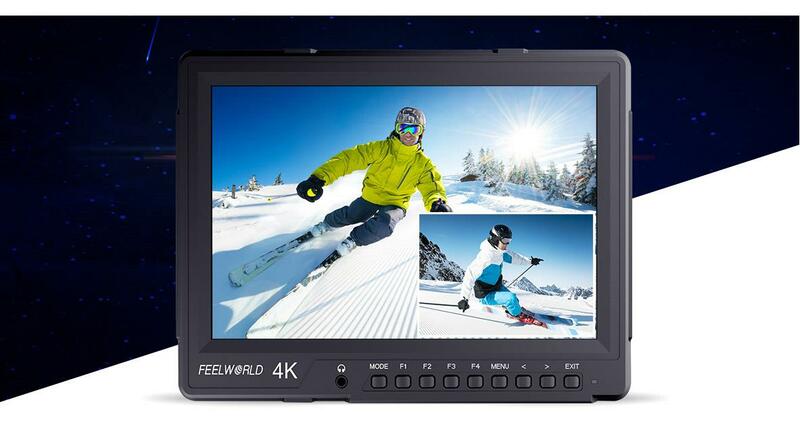 FEELWORLD 4K101HSD-256 monitor is ideal for high end broadcast monitoring because they feature high quality dual view, so you can monitor two input sources simultaneously. 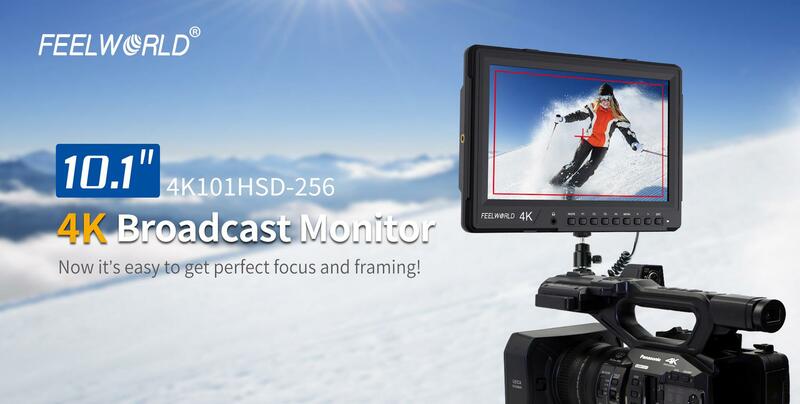 4K101HSD-256 also includes focus assist, check field, image freeze, image flip, center marker, safe frame, pixel to pixel, color temperature adjust, assist users to accurately monitor when shooting, making and playing movies/ videos. With 2560X1600 high resolution Precise Color, an impressive 298.9 PPI (Pixels Per Inch), blending individual pixels to the point that the naked eye can’t define individual pixels. sharper images, brings you the perfect visual experience. You can shooting video with confidence for broadcast, post production, on set monitoring, broadcast trucks and more. 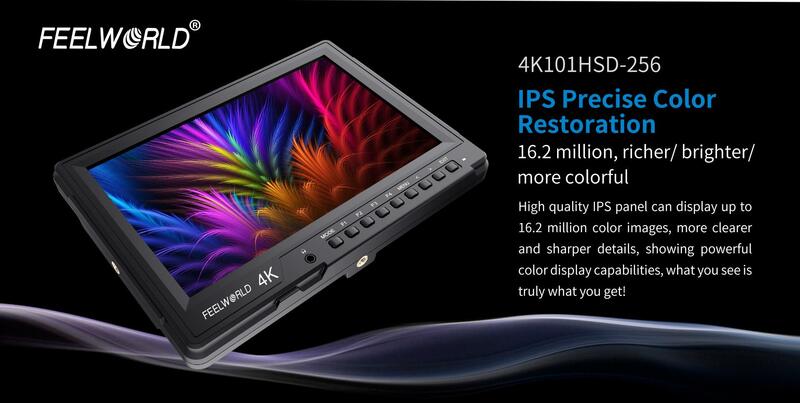 4K101HSD-256 uses an IPS panel, which provides a wide 178°/178°, let photographer, director, film crew members can see accurate, consistent and bright images from any point of view.. When you’re in the middle of a job you can’t be fumbling with controls to change settings on your monitor. 4K101HSD-256 gives you easy front panel control that you are able to quickly and easily controls auxiliary functions and input selection. 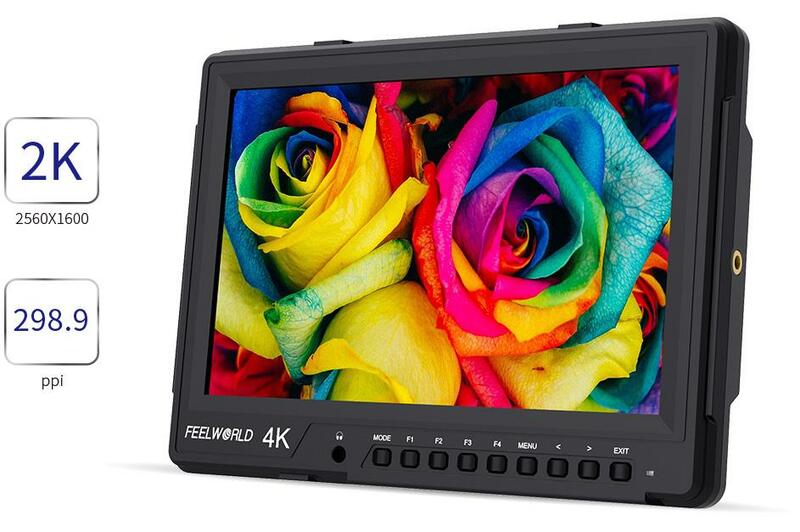 FEELWORLD 4K101HSD-256 features high quality 3G-SDI and 4K HDMI2.0 inputs for connecting professional SDI and consumer HDMI cameras. Its SDI Input supports all SD, HD and SDI formats up to 1080p 60Hz and HDMI input supports formats up to 4K 2160p 60Hz, perfect support for almost all signal formats. 4K101HSD-256 includes professional SDI output, allowing it to not only display live signals, but also send them out to other monitors simultaneously. It’s the ability to display live picture on multiple displays at once while still maintaining the original video quality. You can also monitor audio using the 3.5mm stereo headphone jack or the built in speaker. 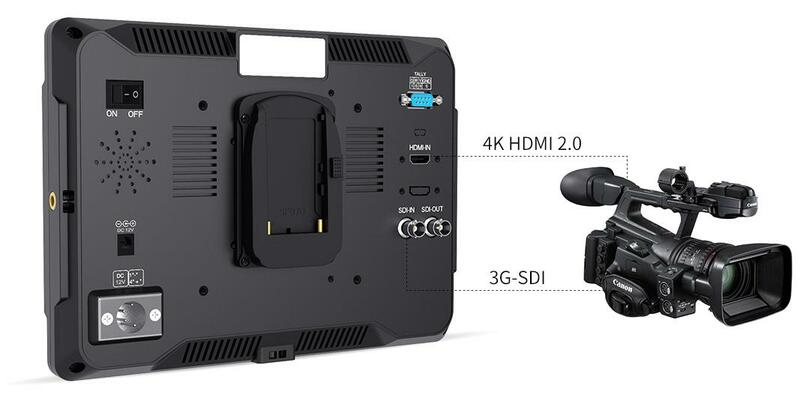 4K101HSD-256 can see more video sources on a single monitor, supports dual view, single view monitoring functions, allowing you to get perfect two camera monitoring in any location! 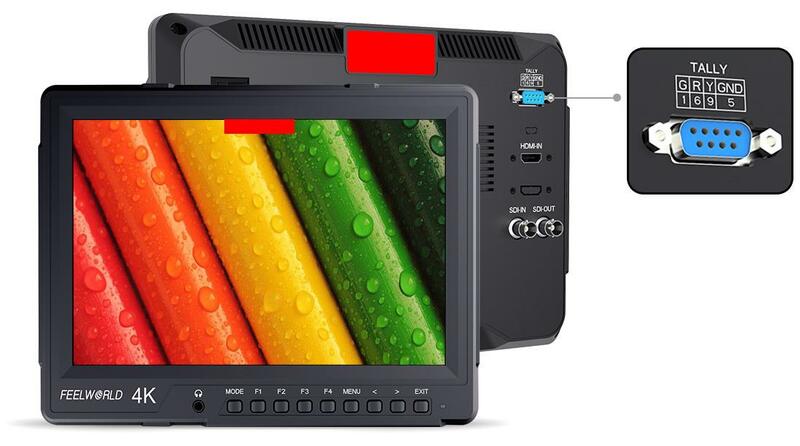 2P-LR, 2P-TB, PIP meet your different screen display needs, you can adjust the brightness, contrast, hue, saturation, sharpness, backlight of the two split screen, to help the director to determine and adjust the screen consistency, create the ideal image. Meet your different screen display needs. 4K101HSD-256 with 3 colors display (Red,Green,Yellow), and controlled via DB-9 ports on the rear panel. Innovatively designed soft tally function can not only tell the photographer being recording status, also make you experience that professional technique of TV recording you the convenience for your creation. 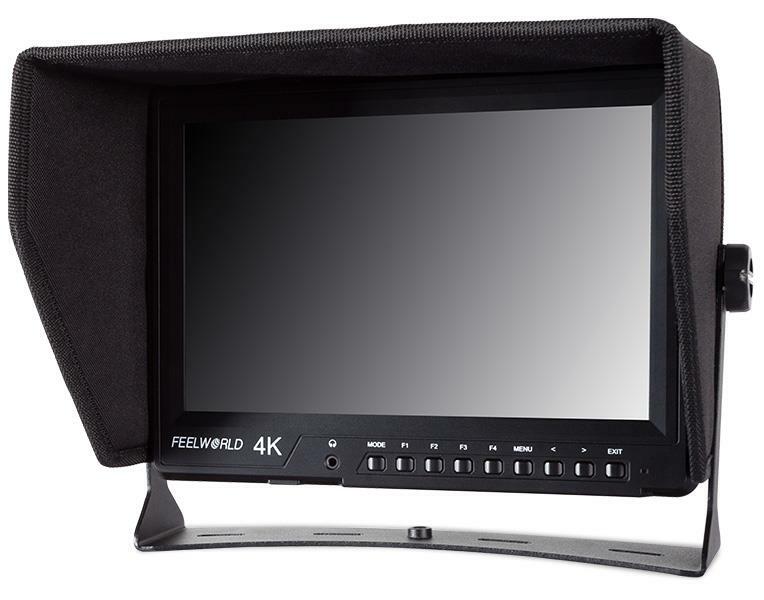 FEELWORLD 4K101HSD-256 monitor standard sunshade, easy to carry folding, for you in the light under, the location of shooting light to monitor the impact of the screen to provide an effective monitoring environment. We’ve made it easy to power the monitor. The 4K101HSD-256 can be powered in three ways: with an DC 12V power, XLR power, lithium batteries. The 4K101HSD-256 has a flexible battery system that supports F970 battery plate (standard), D28S/D54, LP-E6, U60, Sony V and Anton battery plate of your choice.